Arm balances have long been my favorite kind of pose to practice, with one notable exception: eka pada bakasana (one-legged crow pose)1—specifically, eka pada bakasana B, in which one knee is propped up on its corresponding upper arm (as in crow pose), and the opposite leg is extended back (as in flying pigeon pose, or eka pada galavasana). For years, no matter how hard I tried, each time I endeavored to come into one-legged crow from a lunge (an entrance that’s often considered more accessible than moving into the pose right from crow), I experienced the following: I could work my front knee up onto its corresponding upper arm easily enough, but trying to lift my back foot off the floor felt like trying to lift a ton of bricks. And it certainly didn’t help that I was attempting to do this while perched up on one arm instead of the more stable and familiar two! Letting go of the idea that there was one “real,” “right” way to do one-legged crow made all the difference. Recently, I’ve been having a lot of fun incorporating props into my eka pada bakasana practice, and whenever I come across a creative new way to prop the pose, I can’t help but wish I’d known about it years ago. But though it would have saved me a lot of grief, at least I can do that now for you. Here are a few of my favorite ways at present to use props in the pose. All you’ll need is a yoga block or two and (for one of the variations) some wall space. Each option includes both a propped variation and a way to use the prop(s) to move into an unsupported one-legged crow if you wish. I recommend practicing these variations in the context of a complete yoga practice. (I don’t recommend approaching them cold!) 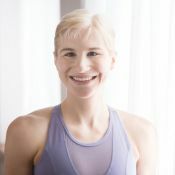 A “complete practice” doesn’t have to mean a full 90-minute event, but at the very least you will want to do a few of your favorite warm-ups and/or sun salutations, some hip stretches, maybe a bit of core work, and whatever else your body needs to feel ready to approach arm balances. Practicing with one shin on a yoga block is a great alternative to, or prep for, traditional one-legged crow because it familiarizes you with the basic shape and mechanics of the pose while lessening the intensity of the strength and balance work required. Come into a squat with your feet together, knees apart, and heels lifted so that you’re on the balls of your feet (the same way you might set up for crow pose). Place a yoga block on its highest setting and narrowest width a few inches in front of your toes. Then plant your hands in front of the block, shoulder width apart, wrist creases parallel to the short edge of your mat, with fingers spread evenly and comfortably apart, rooting down into your finger pads and finger knuckles (again, as you would for crow). There are two ways you could come into the pose from here. If you’re really comfortable balancing in crow pose, try option one. If holding crow is a bit more of a challenge, choose option two. Option 1: From your prep position, lift your hips high, work your knees up onto your upper arms, and come into crow pose. Keep your left leg where it is, but slide your right shin to the left, bringing it to rest on top of the block. Option 2: From your prep-position squat, lift your hips and step your left foot a few inches to the left, so that your left toes are in line with your left wrist. Work your left knee up onto your left upper arm, and with the ball of your left foot still on the floor, bring your right shin to rest on top of the block. Then lift the toes of your left foot away from the floor. Once in the pose, push the floor away from you with your hands, engage your abdominals to round your back, and squeeze your left heel in toward your seat, gazing just slightly forward. You can stay here for three breaths, or for as long as you can maintain a smooth, steady breath. If you’re feeling strong in the prep, you might even try coming into the classic eka pada bakasana from here: Continue to press your hands into the floor, contract your abdominals to round your back, and squeeze your left heel into your seat. Shift a little more weight into your fingertips, and see if you can bring your right knee into your chest, drawing your shin up off the block! Stay here, or, to extend your right leg behind you, continue shifting your weight forward (this will serve as a counterbalance as you begin straightening your right leg), and then stretch your right leg back and up. Aim to stay for a breath cycle or two (or even more if you can!). To come out of the pose, bend your right knee and see if you can bring your right shin back to the block (or just lower the toes of your right foot to the floor if you need to). Return to your prep-position squat and switch sides. A lot of us learn to come into crow pose by standing on a block. This entrance can be similarly helpful for approaching the one-legged variation. We'll start with the other side this time. To begin, come into your squat prep (as described in the previous variation) with your feet on a block (on its widest and lowest setting). Plant your hands as you would to come into crow pose, and begin to work your knees as high up onto your triceps as you can. Then, shift forward a little more, bringing more weight into your fingertips, while still keeping your toes (at least your big toes!) on the block. Keep your right leg where it is, but lift your left toes off the block and then squeeze your left knee in toward your chest, sliding it off your upper arm. Your right toes will still be on the block. Push your hands into the floor, engage your abdominals to round your back, and gaze slightly forward. You can choose to remain here for a bent-knee one-legged crow variation. Alternatively, while keeping the toes of your right foot on the block, stretch your left leg back and up behind you. As you do this, shift your weight forward a little more to counterbalance. Aim to stay for a breath or two. Then bend your left knee, bringing the toes of your left foot back to the block, and switch sides. If you’d like to use this variation as an entrance into an unsupported eka pada bakasana, here are two approaches you might try. 1. Come into the pose as described above. Then, with your left leg extended, shift your weight forward a little more and see if you can lift the toes of your right foot off the block. 2. Come into the prep as described above, but don’t extend your left leg just yet. Squeeze your left heel into your seat, and from there, shift your weight forward a little more and see if you can lift the toes of your right foot away from the block. Remain here for an unsupported bent-knee one-legged crow, or stretch your left leg back and up for the classic variation. Personally, I like the second approach a little better because (initially) it’s easier to lift the foot of a bent leg away from the floor than it is to lift the foot of a straight leg. I also find it easier to negotiate my balance if I don’t have to work so hard to get my back foot airborne. Try both ways and see which works best for you. In this take on the pose, a wall supports your back foot. It may take a little time to figure out your ideal distance from the wall (which will depend on your proportions), but setting up in your squat prep with your feet about your legs’ length away from the wall is a pretty good starting point. You can begin by sitting with your back against the wall, extending your legs (as in dandasana, staff pose), and seeing where your heels are. You may wish to place a yoga strap or other marker there to mark this distance. Come into your squat prep facing away from the wall so that the balls of your feet are where your heels were, and plant your hands to set up for one-legged crow. You can also stand on a block for this variation, if you’d like. From here, lift your hips and work your right knee high up onto your right upper arm, keeping your toes on the floor or block. Then, keeping your hips high, stretch your left leg back behind you and place the ball of your left foot on the wall (a little higher than your hip height). Your left knee should be just a little bit bent at this point. If it’s not, come down and move closer to or farther away from the wall as needed. As you straighten your left leg (keeping the ball of your foot on the wall), you’ll naturally lean forward into the arm balance a little more, and you may find that you can lift your right foot away from the block or floor! As in the previous variations, push your hands into the floor, round your back, and gaze slightly forward. If you’d like, you can even try shifting forward a little more and lifting your left foot away from the wall! Stay for a breath or two, then return to your prep-position squat and switch sides. I hope you have a blast exploring these variations and making them your own. Most of all, I encourage you to experiment with these suggestions to find a variation that works for you. Embrace what makes sense, discard what doesn’t, and remember that every day, every practice, and every attempt at a pose is different. After all, our yoga practice morphs and grows as we do, and that means that the “real” and “right” way to do any pose is the way that feels best in your body right now. 1. While bakasana is technically “crane pose” and not “crow pose” (kakasana = crow pose), for simplicity’s sake in this article, I'm choosing to use the most common English name and the most common Sanskrit name for the pose. The difference between crane pose (bakasana) and crow pose (kakasana), is that your arms are straight in crane, and they’re bent in crow. You’re welcome to practice the variations in this article with bent OR straight arms, though bent arms (as I demonstrate in the photos) is generally easier and more accessible when you’re learning the pose.